Christmas is coming! We’re less than a month away from celebrating the most wonderful time of the year, and I’m already picturing how I’ll decorate my house for the joyous occasion. I KNOW. Stop judging me for being so excited for Christmas already. I get it, but that doesn’t mean that I can’t be excited for the Christmas season all year round. 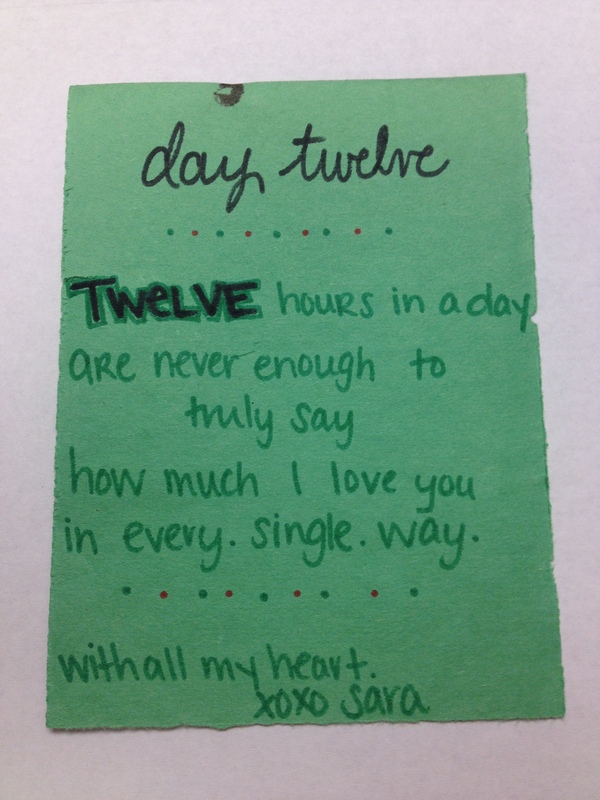 Two years ago for Christmas, Jenna did this really cool thing that she found on the internet for Mark, where she did “The 12 Days of Christmas Gifts”. So, for the 12 days leading up to Christmas, she got Mark a little gift. She also did it last year. 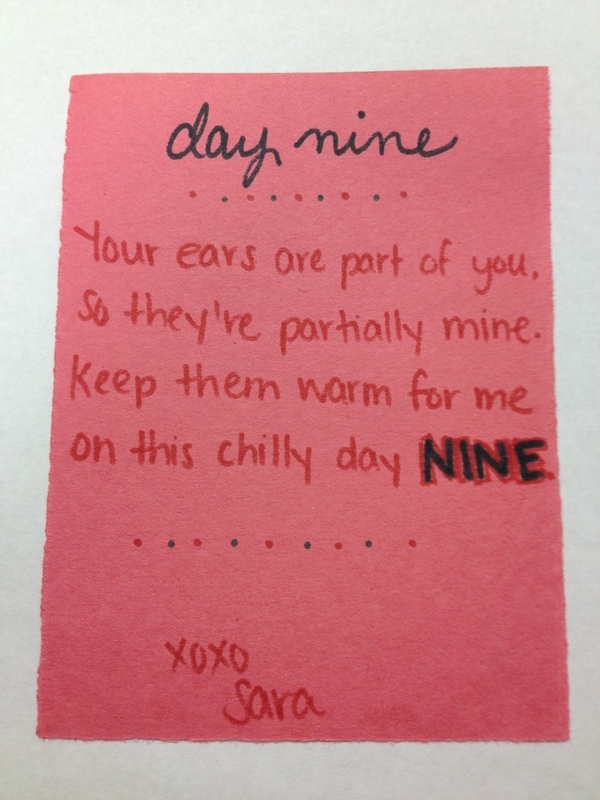 The little gifts coordinate with the number of the day… That sounds confusing…. You’ll get the picture in a minute. Last year, I decided that I wanted to do the same for Peter. I am posting this now just in case you think you may want to do it for someone. It takes a lot of thought to get it all together – well, it did for me anyways. 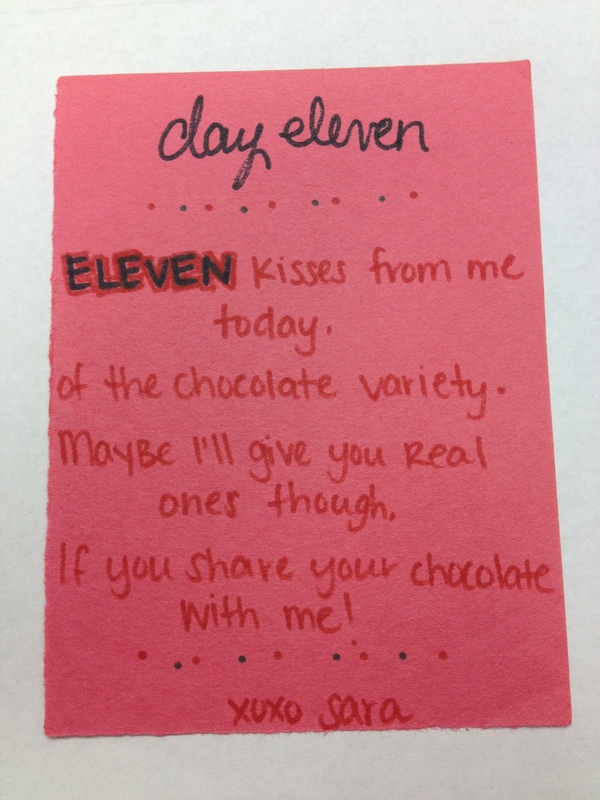 And then, of course I had to come up with a little rhyme for each day, which added extra stress, but I actually loved every second of it. Below are the 12 Days of Christmas Gifts that I did for Pete last year. He really loved finding a little gift every day. It gave him something fun to look forward to, and he really had no idea what his gifts would be every day! 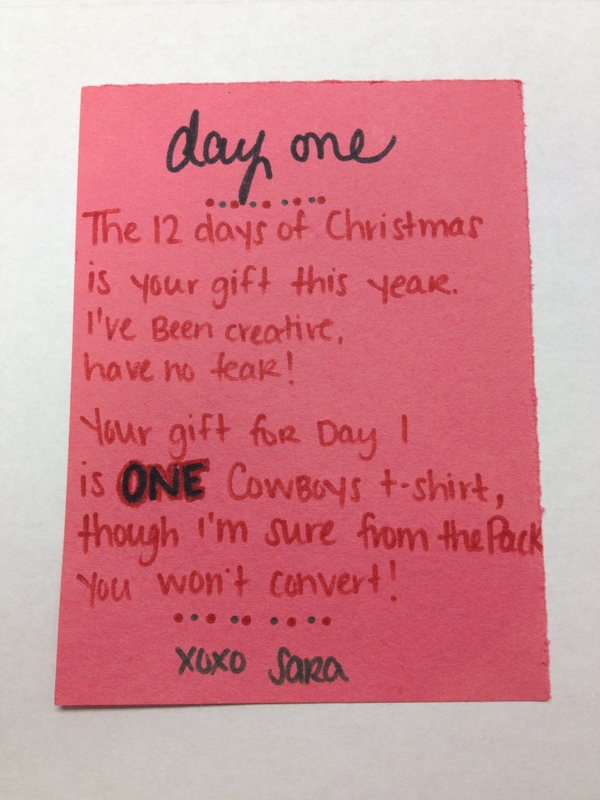 HUGE thanks to Jenna, B and another friend M who helped brainstorm gifts and rhymes! Day 1 happened to fall on the day that we were leaving for Dallas to go to the Cowboy/Packer game. Pete is a die-hard Packer fan, but I thought it would be fun for him to have a Cowboys t-shirt to support his friend that plays on the team. For this gift, I snuck in the bathroom and put the t-shirt + note on the counter while he was showering. Day 2 was a bit trickier, as we were waking up in a hotel room and there aren’t many hiding places. 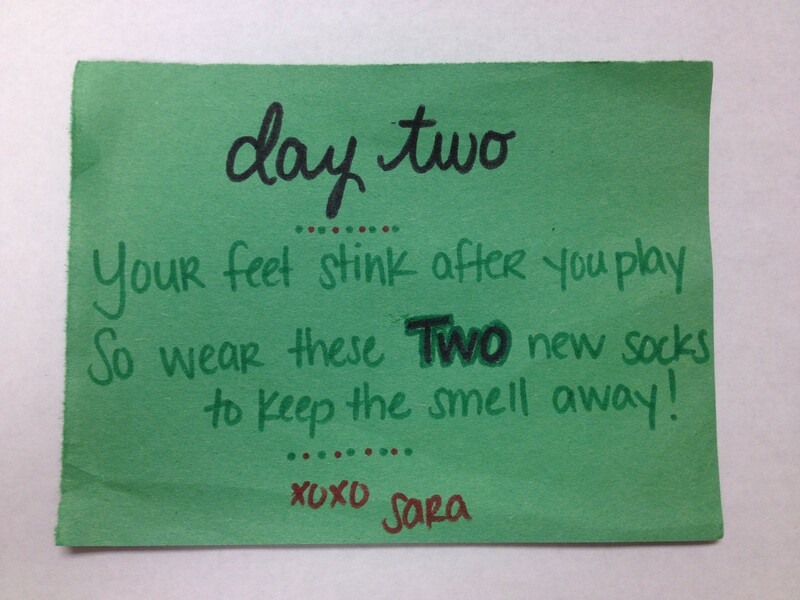 So I put the socks in his suitcase with the little note for him to find later. Pete had just joined an indoor soccer team, so this gift was super fitting. This was the day we got back from our trip to Dallas, so I put them sticking out of his underwear drawer for him to find when he was unpacking his suitcase. I put them there right before we left for our trip. 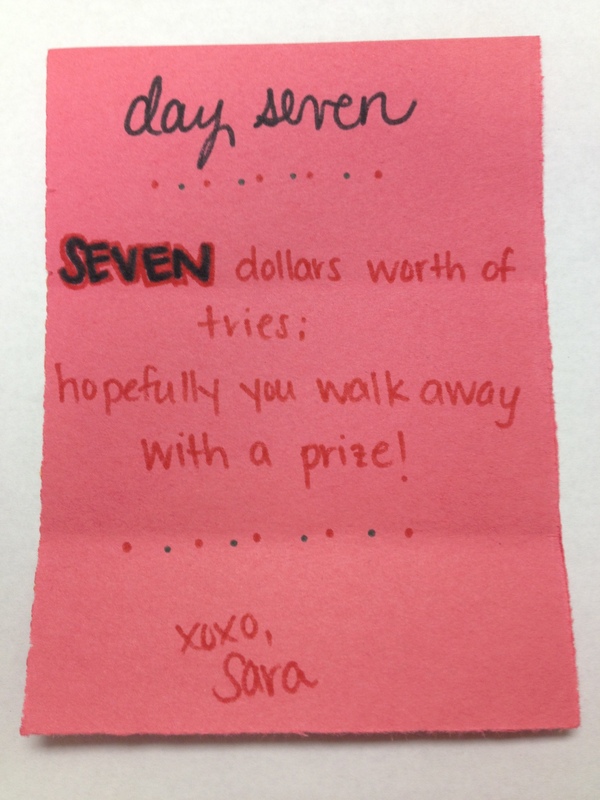 Jenna did the same gift for Mark, and we both used this note. We were laughing SO HARD when she came up with it!!! It was especially fitting for Peter because he gets annoyed with me when I call his boxers “undies”. I can’t help that I think it’s hilarious. This one was also a little tricky, because I had no idea how I was going to make it work, since we got back from Dallas really late the night before. 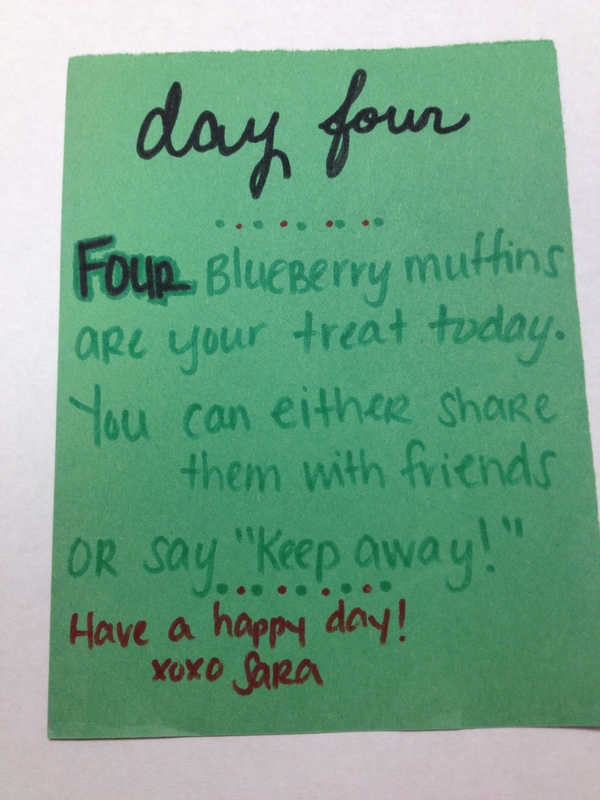 I ended up asking one of my friends who also happens to be one of Pete’s coworkers, to go to the store and get his favorite muffins, and then I scanned the note and had her print it and put the muffins + note on his desk for when he got to work. He was pretty surprised that I had little elves helping me! Pete had just started reading the first book, and he REALLY enjoyed it, but he had borrowed the first one from a friend. 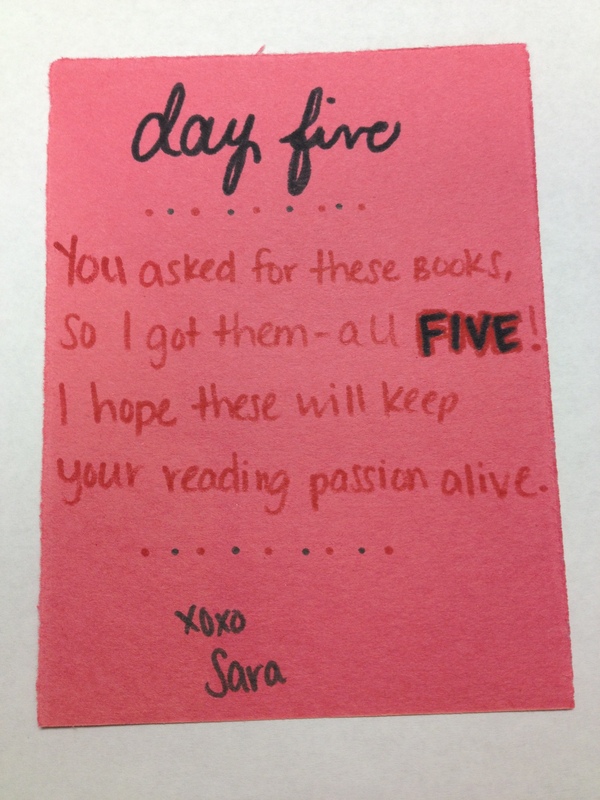 How perfect that the series has 5 books! Credit to B for thinking of this one. I left the books on Pete’s nightstand before he woke up this morning, since he likes to read before he goes to sleep. *Six* bottles of Mountain Dew. It really proves how much I love you! What can I say. The man loves his Mountain Dew, and it was an extra special treat that his wife bought it for him. Left this in the fridge for him to find – shocking, I know. Well THIS ended up being a disaster. Jenna gave me this idea. In Illinois, they have a “Lucky 7” lottery ticket. Well, apparently that doesn’t exist in northern Wisconsin, at least not at the 4 gas stations where I stopped. And also, I need to say that I’ve never even bought scratch-off lottery tickets (or any lottery tickets) before, so I put $20 in the machine, and learned that you don’t get change back. So I was mad, and then had to buy all these damn lottery tickets. I scratched off $13 worth in the gas station parking lot, and of course didn’t win anything, which made me even MADDER. Pete’s ended up not winning either, but I was just so MAD about the whole affair. I put the lottery tickets in his wallet one morning before he left for work. Day 8 (December 21): a date night! Dinner and the Botanical Gardens at *8*! This one was super cute and fun, probably because I could reap the benefits as well haha. For this one, Pete and I went to dinner and a movie – Saving Mr. Banks (Thanks A for remembering!!) – but definitely didn’t wait until 8:00 to see it… That’s way to late for us haha but I needed a rhyme!! In Green Bay, the Botanical Gardens have a really pretty Christmas/winter wonderland light display set up, and I love going every year. It is soooo Christmas-y and wonderful! So… This one doesn’t correspond with the day (it should have been something with 9…) but if you live in Wisconsin you will remember how ungodly cold it was last winter. Pete, my brother, my brother-in-law, and my sister’s boyfriend went to the Packers game this day, so the gift was perfect. I put this gift in his coat pocket for him to find. Go out to lunch today on me. The man loves Culver’s, and I’m not a huge fan (aside from their custard), so it was another special treat for him. Girl’s gotta do what a girl’s gotta do. Pete had been wanting a new watch for a while, so I splurged on the last day of gifts and got him a nice one. He still wears it every day!